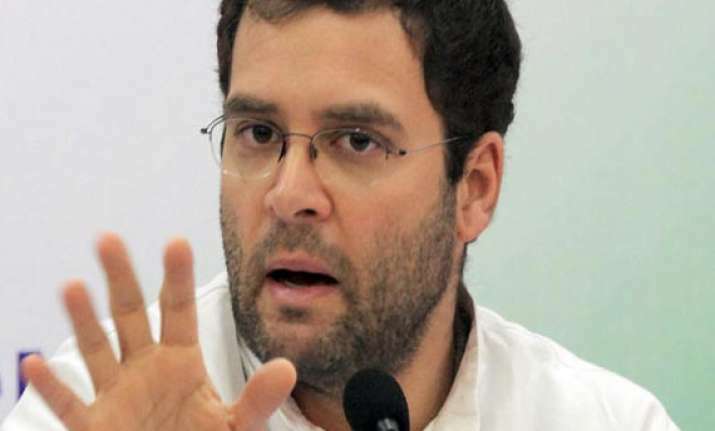 New Delhi, July 27: Describing the Food Security Bill as “historic”, Congress leader Rahul Gandhi today asked partymen to take its message to grassroots and prepare the people to fight for their legal entitlement. Maintaining that “nobody will sleep hungry in the country once this is fully implemented,” Gandhi told party leaders from states “we have given them a right. You prepare them to fight”. Gandhi's opening remarks at the meeting of the PCC chiefs and CLP leaders of all states on the food security issue also saw a demand by party leaders from a number of states to name the scheme after Rajiv Gandhi so that opposition-ruled states could not appropriate it. The demand comes in the backdrop of two Congress-ruled states Delhi and Haryana deciding to implement the scheme from August 20, coniciding with the birth anniversary of Rajiv Gandhi. Rahul had left the meeting hall when the demand was made.